No one wants to spend their whole weekend mowing. 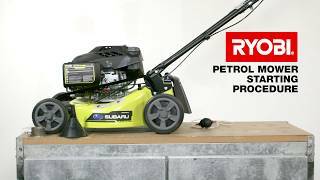 Getting the right mower can help reduce the amount of time it takes to mow the lawn, so check out the Ryobi 190cc 4 Stroke Lawn Mower. 11.2Nm of torque to help power through dense grass. 460mm cutting path with adjustable cutting height, meaning less passes to get the job done. 4 swing back blades for increased cut and safety. This mower also comes with a 2 year replacement warranty, giving you extra peace of mind. That's not all - the mulching plug lets you cut your clippings down to size to be used as mulch for your lawn bed. This means you have a convenient, natural fertilier applied every time you mow. Want to see this lawn mower for yourself? Head down to your local Bunnings Warehouse today.